Are you doing all you can to train your employees properly? Can’t find the time or resources for safety training? McCord Safety Training can help! We offer affordable video training programs in hearing and eye safety, back safety and proper lifting, mower and equipment operation, heat stress and safety and more! Developed by Mickey McCord, a 25-year career golf course superintendent, these 10-18 minute video training programs are golf course specific. Great for rainy days, new-hire training or staff meetings, they are designed to be both informative and entertaining to hold your crew’s attention and get them thinking about safety, every day. 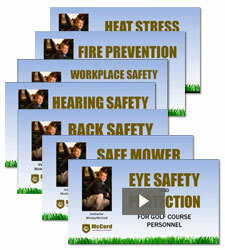 McCord Safety Training Videos are available by annual subscription. Unlimited use of all videos — in English and Spanish — for twelve months is only $300. All videos are constantly updated and revised. Spanish translations are underway and are being released as they are finished. We are committed to helping your staff work safely, so we won’t “love you and leave you”! You will receive periodic emails with safety tips to communicate to your staff, reminders about holding safety training classes, and tips for motivating your staff to work safely and “buy-in” to the program.